Yesterday I took a walk early in the day because the weather has been so hot in the later afternoons. I took the shortest route to the Seine -- via Avenue Emile Zola and then rue Linois -- and arrived at the bridge that goes to the west/south end of the Allée des Cygnes. 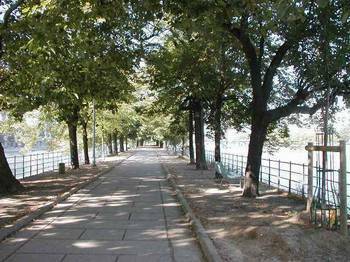 The Allée is a long, narrow island in the middle of the Seine -- a nice place to walk because it is peaceful and quiet. At the end where I started, the Pont de Grenelle, is a Statue of Liberty just like the one in New York, only smaller. But it is big enough that I could not get a good picture of it there -- it is better to wait and take one from a boat or from the right or left bank. On July 16, 1942, the French Police (under the Vichy government, who were French bureaucrats acting as Nazi puppets) rounded up 13,152 Jews. They were supposed to round up 28,000 -- I hope that means that someone had the wit and the heart to forewarn those whose names were on the list. Men and women who did not have children with them were sent directly to the Nazi death camps. 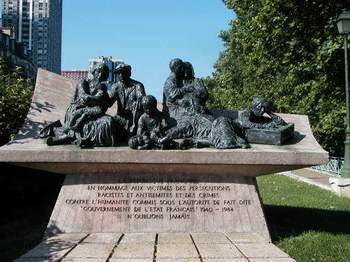 The remaining 4,115 children, 2,916 women, and 1,129 men were put in the Velodrome d'Hiver where they were, over the next six days, gradually loaded into busses or trains and sent to their deaths. During the six days of sweltering summer heat, they were offered no amenities -- no toilets, nothing. What were all the other Parisians doing during that six days, I wonder? The engraving beneath the sculpture by Walter Spitzer makes it very clear that the French government now accepts full responsibility for what happened. This was done in 1995 by the newly elected Chirac (I don't think Mitterand would have ever done this -- from my summer reading, I am gathering that he was quite an anti-semite). Chirac not only commissioned the sculpture and issued the statement of responsibility and enduring grief, but he also started a tradition: every year, in July, a ceremony commemorates the round-up of Vel d'Hiv. The actual site of the Vel d'Hiv is now a block of modern apartment buildings. But as I walked down Blvd. de Grenelle toward home, I was startled to see that a tiny garden next to the sidewalk, a part of one of these buildings, has been turned into a memorial that more passers by will see. There is another engraved plaque on the wall, describing the atrocity that happened there in 1942, and people have been leaving flowers there ever since. All of this was very moving. I got all choked up, and thought of my dad's older brother, Uncle George, who was among the Allies who went to France to beat the Nazis back. Uncle George was there for only a couple weeks in 1944 when he was killed, near the city of Nancy. 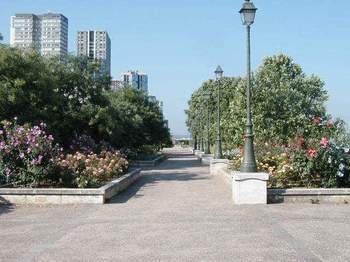 Later in the day, Tom and I walked together in the village called Boulogne-Billancourt, a suburb just south of the Bois de Boulogne, and visited a park called Eduoard de Rothschild. This park is, I think, the grounds of a Rothschild house called Boulogne-Sur-Seine. The ruins of the house are still there, and it looks like the place is in terrible shape. But the grounds and gardens are wonderful. 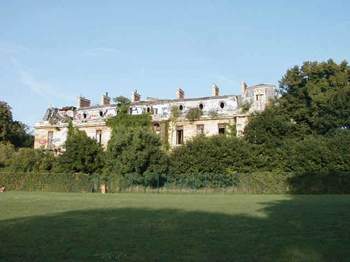 I am hoping to be able to discover the location of the grandest Rothschild house, the Chateau de Ferrieres, which was given to the University of Paris in 1975. Wish me luck! 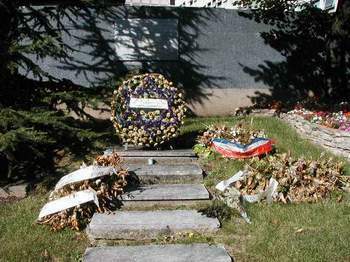 "The Republic of France, in homage to the victims of racist persecution and anti-semitism and crimes against humanity committed under the authority of the government of France, 1940-1944. We never forget." Sculpture by Walter Spitzer in the Place des Martyrs Juifs du Velodrome d'Hiver, near Bir Hakeim in the 15th arrondissement. 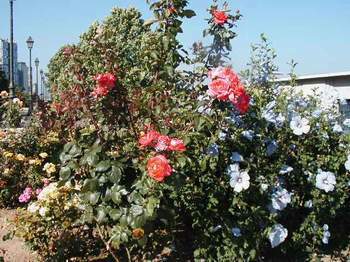 Rose garden in the Place des Martyrs Juifs du Velodrome d'Hiver. Another, more informal, memorial to the martyred Jews of 1942, located more directly on the site of the Vel d'Hiv, next to a modern apartment building on the Blvd. de Grenelle. Paddlewheel boat on the right bank, near the Allée des Cygnes. The Allée des Cygnes, in the middle of the Seine. Derelict house at the Parc de Eduoard Rothschild. It is fenced off so people cannot go into it, but vandals have already been there and done great damage. This house was probably confiscated and used by the Nazis during the occupation. The Rothschilds, who were Jewish, all had to flee. Most went to America to wait it out; some went to relatives' homes in England. The gardens and grounds in the Parc are still lovely. 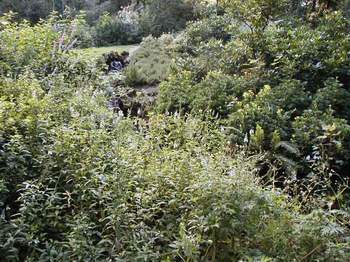 This fern and wildflower garden has a spring-fed stream going through it. There was also a wonderful Japanese garden, lots of trees and trails, a lake -- and a even a place for training horses at one end of the park.